Hallberg Insurance Advisors launches a local charity program in the Orland Park, IL area to seek active support from the agency’s network of customers and business partners in helping the community. Its first campaign will raise funds to help a 13-year-old boy, who was born with congenital heart disease, cover partial medical bills; necessary treatments, expensive medication and possible transplant surgery. Hallberg Insurance Advisors in Orland Park, IL announced the debut of its charity program designed to benefit the local community. The agency will work closely with nonprofit organizations in the area, to nominate a new beneficiary every 60 days. The idea is to create a campaign to help the elected individual, family or programs with immediate support by bringing awareness to those very important causes. To launch the program, Tom Hallberg, the agency’s principal, has chosen to introduce Open Your Heart. The campaign’s mission is to help Nicholas, a young boy born with congenital heart disease. Before the age of three, Nicholas had already been through four heart surgeries. Recently, his health worsened diagnosed with Celiac disease, seizures, and fluid retention. If it results in live failure, a heart and live transplant is his only option to stay alive. This working family does not have the means to cover all the medical expenses. “We can’t imagine how hard it must be for this family to see Nicholas battle several life-threatening conditions to stay alive. His smile through these unfortunate situations is what inspires us. We want to help take away the financial worries for this family and let them focus on what’s important; Nicholas’ health”, said Tom Hallberg, founder and President of Hallberg Insurance Advisors. 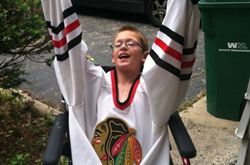 A fundraising event for Nicholas will take place this Saturday, April 11th, at the American Legion Hall, in Lockport, IL. The event will last from 4:00pm-10pm featuring a silent auction, split the pot raffle, cash bar and a live band 97.Nine. Tickets are on sale for $25.00 that will include dinner. Each new cause showcased by the agency will accompany a detailed full story about the elected cause on a designated donations page. To join the Hallberg Insurance Advisors in supporting Nicholas and his family cover the medical bills, necessary treatments, expensive medications and possible transplant surgery, donors are encouraged to visit http://hallbergadvisors.com/Open-Your-Heart-_6_community_cause and share it with their friends and family through social media and email. With the newly launched program, Hallberg Insurance Advisors takes responsibility for promoting that page through its many channels, to include its own database of thousands of customers, business partners, staff, neighbors and friends. As an insurance agent in Orland Park, agency owner, Tom Hallberg knows many local families. His knowledge and understanding of the people in his community helps provide customers with an outstanding level of service. Tom and his team look forward to helping families protect the things that are important - family, home, car and more. They can also help clients prepare a strategy to achieve their financial goals. To contact an expert at the Hallberg Insurance Advisors, call (708) 364.1300.